Chinese beachgoers wear body suits and protective head masks, dubbed "facekinis," on a crowded public beach in Qingdao, on Aug. 16. BEIJING – In the West, getting a tan is one of the main reasons for going to the beach. 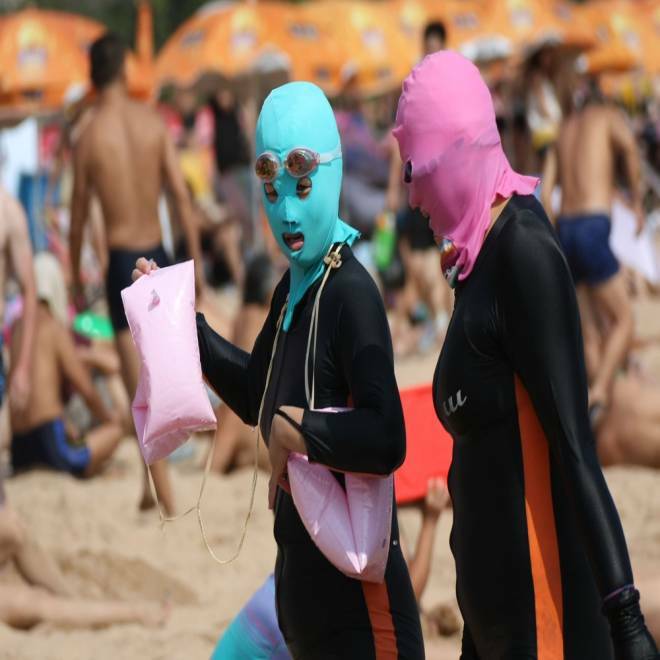 But in China, some are going to extraordinary lengths to avoid getting a bit of sun with a new item of beachwear – dubbed the Facekini – causing something of a stir in the coastal tourist city of Qingdao, Shandong Province. The masks completely cover the swimmers' heads, revealing only their eyes, noses, and mouths. The styles and colors of the masks suggest a huge happy beach party attended by some lesser superheroes, Mexican wrestlers and perhaps a few bank robbers is underway. In fact, government officials have become concerned that the masks could be used to rob banks, according to a report in The New York Times. "These have been extremely popular," Zaizaibao (仔仔寶), an online seller from Henan on shopping Internet site taobao.com, said. Another online store sold 542 masks, which come in different colors and patterns, in just 30 days. "We are already out of the pink ones.... All of them sell well. Orange is the most effective in protecting people from sea creatures." Users say the face masks are useful in protecting against insects and jellyfish. The masks are an outward expression of a Chinese understanding of beauty in terms of skin color. "I myself don't mind getting tanned, but I can see why pale skin is attractive," Alina Zhao, a college student in the U.S. who grew up in Zhejiang, China, said. "It definitely has to do with the history of China, which is largely an agricultural society,” she added. “Getting tanned means you work outside in the fields a lot, so skin color is like an indicator of your social status. The fairer you are, the wealthier or more respected you seem." 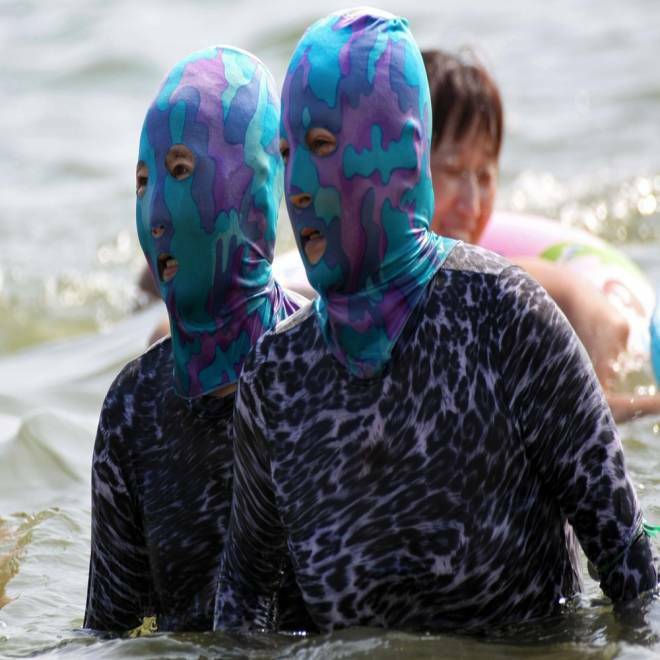 In fact, Facekini is only one out of many attempts by Chinese people to stay fair. The number of umbrellas to be seen in Chinese cities on a hot, sunny day might appear bizarre to many non-Chinese people. "I first became aware of the phenomenon when I lived in Taiwan for the summer," Simone Cote, from Vermont and currently working in Beijing, said. "I constantly saw that women covered themselves when they went out. They wore pants often, and yes, umbrellas everywhere." Cote was asked "Why is your skin so dark?" by her host mother in Taiwan. Within this underlying concept of what is beautiful, the Facekini was perhaps a logical development. A user of the mask commented in Chinese on taobao.com that "this item is very effective in keeping the UV [ultra-violet light] out, and it's very comfortable. With this, you can do whatever you want on a beach, with no worries of getting burned or tanned. It's really recommended." Another user, Tongchao, seems to have debated between the benefit of not getting tanned and the possibility of getting laughed at in this mask. "Okay. I've become the focused again, but this item is really useful. It's actually not stuffy at all. I really like it!" Looks like he or she has made a choice – but not an easy one. When asked if she would ever wear one, Alina gave her answer without a second thought. "Of course no! I was never into sunscreen – I'll never get this fair anyway, so why bother? I would rather enjoy the sun."